Agnieszka “Agnes” Szaroleta Grzeskowiak (1854-1918) was my 2nd great grandmother. She was married to my 2nd great grandfather, Albert Grzeskowiak (1849-1931), whose stabbing you read about here. Both immigrated to the United States around 1880 and settled in Detroit, MI. Here they are in a photograph probably not long before she died at the age of 63. And here is a much earlier photograph of Agnes and Albert with their growing family. I believe my great grandmother, Marianna Grzeskowiak Pawlowski (1879-1941), is the older girl (dark dress) 2nd in from the right. These are the only two photographs I have seen of Agnes. I am on the hunt for others that possibly exist. 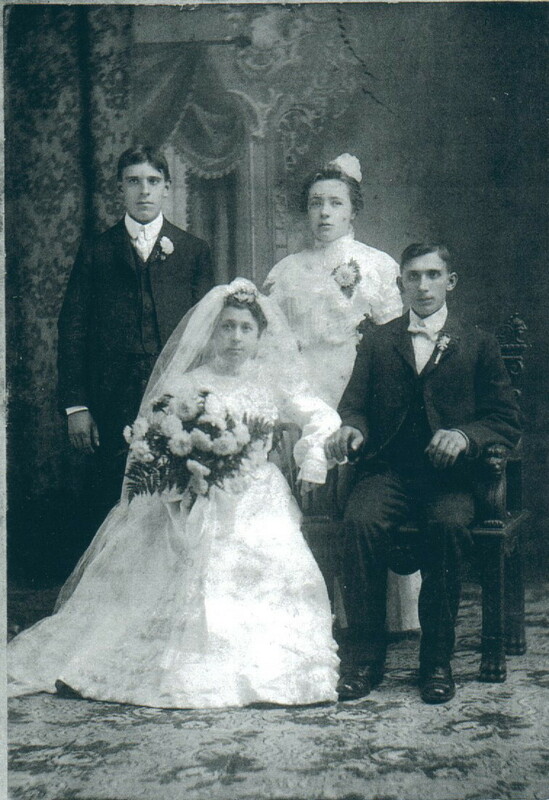 Here is a wedding photograph of Agnes’s daughter, my great grandmother, Marianna. Sitting next to her is my great grandfather Adam Pawlowski (1879-1959). You can read about how I found information on Marianna’s birth (in Poland) here. She came to the U.S. around 1880. In 1900 and 1910 she lived at 339 E. Canfield Ave, Detroit MI (present day 1315 E. Canfield). Between the years 1875 and 1898 Agnes and Albert had about 13 children, the first 3 of which were born in Poland (including my great grandmother). The rest were born in Detroit. She died of liver cancer on September 16th, 1918. Agnes is buried in a family plot at Mt. Olivet Cemetery in Detroit. Here is her death certificate confirming some of these facts. And here is a video I took last year at Mt. Olivet Cemetery to document the Grzeskowiak family plot. There is a lot I would still like to know about Agnes and her life. There are few, if any, people alive today that might remember even second hand stories about her. Plus, I have been researching the Grzeskowiak family for several years through newspaper clippings and I have found no mention of Agnes. As always, the search continues! This is the 39th of 52 weekly posts planned for 2018. It was inspired by the #52Ancestors writing challenge issued by professional genealogist, Amy Crow Johnson. The challenge: once a week, for all 52 weeks of the year, write about a relative in your family tree.